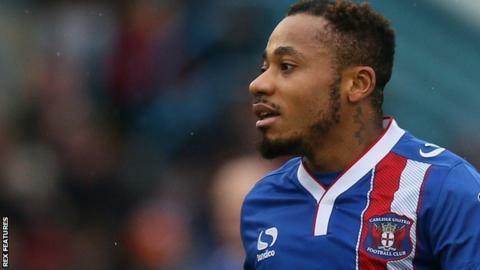 Carlisle United scored twice in two second-half minutes to earn a late fightback victory over Morecambe. Morecambe hit the woodwork twice early on through Ryan Edwards' looping header and Kevin Ellison's follow-up shot, before Ellison ran through to score. But in a second half delayed by a fire alarm, which also caused some fans to be evacuated, the visitors won the points in dramatic fashion. Charlie Wyke netted from the penalty spot and Derek Asamoah hit the winner. Wyke's spot-kick was awarded after substitute Aaron McGowan was adjudged to have pulled back Wyke. And while Morecambe were still recovering, Wyke teed up substitute Asamoah who netted from close range. Match ends, Morecambe 1, Carlisle United 2. Second Half ends, Morecambe 1, Carlisle United 2. Alex Gilliead (Carlisle United) wins a free kick in the defensive half. Jason Kennedy (Carlisle United) wins a free kick in the attacking half. Attempt missed. Bastien Héry (Carlisle United) right footed shot from outside the box misses to the right. Goal! Morecambe 1, Carlisle United 2. Derek Asamoah (Carlisle United) right footed shot from the centre of the box to the top right corner. Goal! Morecambe 1, Carlisle United 1. Charlie Wyke (Carlisle United) converts the penalty with a right footed shot to the bottom right corner. Penalty conceded by Tom Barkhuizen (Morecambe) after a foul in the penalty area. Penalty Carlisle United. Luke Joyce draws a foul in the penalty area. Substitution, Carlisle United. Bastien Héry replaces Hallam Hope. Substitution, Morecambe. Lee Molyneux replaces Jamie Devitt. Substitution, Morecambe. Aaron McGowan replaces Paul Mullin. Attempt blocked. Luke Joyce (Carlisle United) right footed shot from outside the box is blocked. Attempt missed. Hallam Hope (Carlisle United) right footed shot from outside the box is high and wide to the right. Foul by Alex McQueen (Carlisle United). Attempt missed. Hallam Hope (Carlisle United) right footed shot from outside the box misses to the right. Attempt missed. Aaron Wildig (Morecambe) right footed shot from the centre of the box misses to the right. Attempt missed. Alex McQueen (Carlisle United) right footed shot from outside the box is too high. Attempt saved. Mark Ellis (Carlisle United) header from the centre of the box is saved in the top centre of the goal. Corner, Carlisle United. Conceded by Barry Roche. Attempt saved. Alex Gilliead (Carlisle United) right footed shot from outside the box is saved in the bottom left corner. Attempt missed. Paul Mullin (Morecambe) right footed shot from outside the box is close, but misses to the left. Attempt missed. Alex McQueen (Carlisle United) right footed shot from the right side of the box misses to the left. Corner, Carlisle United. Conceded by Tom Barkhuizen.